There are very few days in life that riding a bicycle isn't appealing to me. Last week, one of those days occurred. I woke up coughing, sneezing, dripping snot, and my head felt like it was going to explode. I wasn't about to go to work, but I also needed to get to my doctor. My doctor's office is on the southside and I had no where near the energy to ride my bicycle there. So, I decided to coast on my bicycle downhill to the Pueblo bus station. Thankfully, the #2 Bessemer line goes right to my doctor's office. 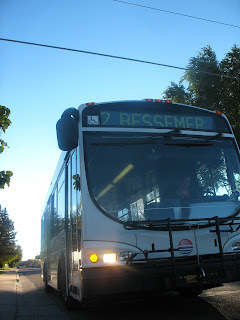 I put my bicycle on the front rack, hung out with the fellow riders, and let the bus do all the work. I arrived at my doctor's office no problem, probably prevented myself from getting sicker, supported the local public transit system, and had a unique face to face experience with people in the community, all for $1.